If you followed Itive for a while you probably already know that we always try to find new ways to extend the online interaction that we usually have with our community to offline world. 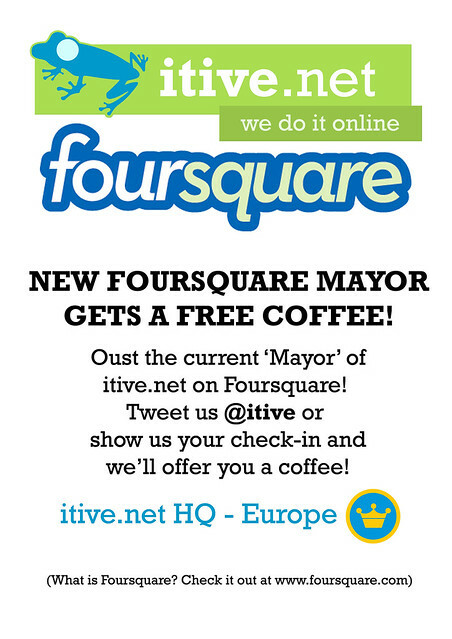 This is why from now on we decided to also give a reward to the people that engage the most with us on foursquare by offering a free cup of coffee to who ousts the current mayor of our headquarters. Why a cup of coffee? Coffee is always a good way to connect, network and find common interests. Let’s get to know each other better, we’d love to meet you! At the moment we are testing this just at our European headquarters, but if it gets good traction we are planning to extend it also to our HQ in New York. Stay tuned!